Then Michigan went back on defense — and that’s when the Wolverines really imposed their will. North Carolina’s Seventh Woods missed badly. The Tar Heels got an offensive rebound, and Leaky Black tried a shot of his own. Rejected out of bounds by Jon Teske. Black then drove one-on-one against Matthews, and the 6-foot-6 guard swatted that shot out of play toward a group of Michigan cheerleaders. Less than two years after a Big Ten opponent called Michigan a “white-collar” team, the Wolverines have emphatically shed that label. They still rely on elements of finesse, especially on offense, but at the other end of the court, Michigan now plays with an edge, cutting off drives, scrapping for steals and blocking shots with contempt. So far Michigan (7-0) hasn’t missed a beat. The Wolverines won a rematch at Villanova by 27 points, and they beat North Carolina 84-67 on Wednesday. The final margin against the Tar Heels was actually Michigan’s closest of the season. Next up for the seventh-ranked Wolverines is 19th-ranked Purdue on Saturday to open Big Ten play. “We just basically came together and said let’s not wait until the end of the year to be special,” Matthews said. Freshman Iggy Brazdeikis took Wagner’s No. 13 jersey and has replicated his fearlessness. Brazdeikis is averaging a team-high 16.9 points per game. Teske, meanwhile, is playing more minutes, and although he doesn’t have the offensive game of Wagner or Brazdeikis, he gives Michigan another line of defense at the rim. The 7-foot-1 Teske blocked five shots against North Carolina. It was Illinois’ Maverick Morgan who said during the 2016-17 season that Michigan was a white-collar team, and at the time, it was hard to argue otherwise. But toward the end of that season, and through all of 2017-18, the Wolverines set about changing that perception. That made for a long night for North Carolina and coach Roy Williams, who ripped himself and his team afterward. 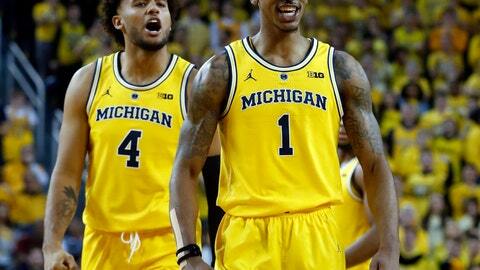 Even amid his frustration, Williams could appreciate what he saw from Beilein’s group.